Many riders just decide they’re poor climbers and feel defeated before the climb even starts. Once you feel like you are slow and struggling, that feeling becomes reality. Stay positive, stay engaged, and keep your head in the game, and your climbing performance will improve (or at least you’ll enjoy it more while you’re working on getting faster). Stop comparing yourself to a younger version of yourself, to other riders who train twice as much as you have time for, or to the pros you see on TV. Trying to match the climbing performance you desire, instead of managing the power you actually have, is the quickest way to get frustrated and exhausted. Embrace the difficulty and be realistic and pragmatic about your abilities. It will be hard either way, but being miserable is a choice. Pace yourself at the bottom of the climb. 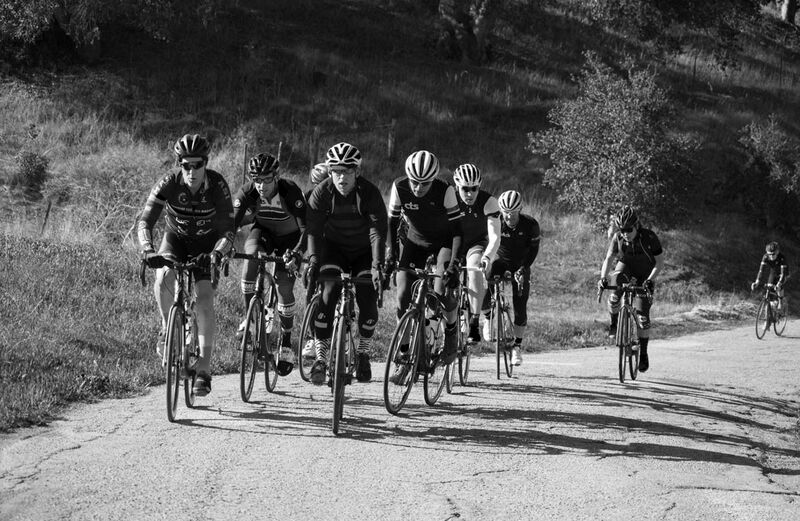 It’s easy to get caught up in the excitement, fear, anxiety of the climb, especially if you’re riding with others. Don’t get caught up in that frenzy as you approach the bottom of a long climb. At the bottom of the climb, it can be difficult to judge the proper pace because you’re fresh. Ease into the climb and allow yourself to settle into your pace. As you progress up the climb, you can always go a little harder if the pace seems too easy, but if you go too hard at the bottom of the climb it’ll be very difficult to ease off the pace while you’re going uphill. Be conservative at the bottom and steady to the top and you’ll likely be catching many of the riders who attacked the bottom of the climb. While staying in the saddle may be the most efficient way to climb, there are times when it is better to stand up and climb. Usually this is a good approach on shorter climbs, on the steeper sections of long climbs or to attack your climbing partners. Standing allows you to use your bodyweight to help you push down on the pedals. As you go to stand up, keep some pressure on the pedals to avoid the slight deceleration that can occur. This is particularly important in tight groups so your back wheel doesn’t “kick back” into the front wheel of the rider behind you. Shift up one or two gears (harder) as you stand. This allows you to take advantage of having your entire bodyweight over the pedals, and it counters the decline in cadence most riders experience when they stand up. Envision driving down with your whole leg, leading from the hip. Gently rock your bike from side-to-side and find a nice smooth rhythm, while keeping your weight over the cranks. The smaller, pure climbers in the pro races tend to gravitate towards this climbing style because of their high power-to-weight ratios, which help them accelerate very quickly. On an undulating climb, you’ll spend more time on the steeper sections than you will on the flatter sections. Increasing your effort on these flatter sections will allow you to pick up the speed a bit, but in the end you will likely lose time because the energy cost to accelerate can make you slower on the steeper portions of the climb. Instead, as the climb levels off a bit use that as an opportunity to stay steady or ease off the pedals, take a quick drink and prepare for the next steep section. This will allow you to push a little harder on the steeper sections, thus decreasing the amount of time you spend at these slower speeds. When it comes to pacing and using your energy/power wisely, the steeper sections of a climb are where you get the most bang for your buck. This point is illustrated by a 2016 study that looked at steady vs. variable power output during time trials. Using mathematical models, when power output was varied independently of the gradient, performance decreased and the rider took longer to complete the time trial. In contrast, increasing power in parallel with the gradient (going harder when the hill is steeper) led to faster time trial times. When most cyclist on prolonged climbs, it’s less that you’re going to go harder on the steeper pitches, and more that you want to pace yourself so you don’t slow down as much on steep sections. Maintaining a more sustainable pace on the flatter sections conserves power for the steep pitches where you benefit most from using your power (as long as you don’t go too hard!). In the study above, increasing power output 5% from a baseline of 200 Watts on a 1% grade made a rider 16 seconds faster over 2.5 kilometers. On a 6% grade, that same 5% power increase from baseline made the rider 78 seconds faster over 2.5 kilometers. Most riders have a tendency to ease off the pedals as they approach the top of the climb, giving away speed and time. Think about how much work you did to avoid slowing down on the steep pitches just a few minutes ago. Don’t give up the time you saved by soft pedaling the last 50 meters! Keep pedaling through the top of the climb to maintain your speed and then use the downhill portion for recovery. Watch the pros on TV, the top guys are almost always accelerating over the crest of the KOM, ensuring that they don’t give away precious seconds or speed. When you’re not competing you don’t necessarily have to surge over the top of a climb, just don’t shut down too early. What I tell riders is to maintain the effort and rhythm they’ve been using over the last half of the climb until they start going downhill. Ride like your summit is 20 meters after you have started going down! This works better if you have paced yourself well (see above) so you’re not dying as you near the top. You can gain a lot of time over the course of a long ride simply by not slowing down as much on the top third of long climbs.